Merchiston Park was the home to East Stirlingshire from the 1880s to the 1920s and is actually the story of 3 grounds. 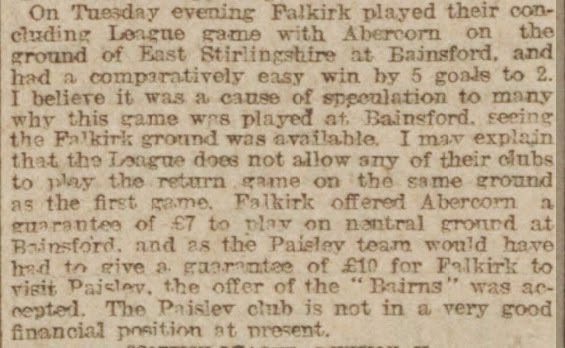 East Stirlingshire had previously played at Burnhouse and then at Randyford before returning back to Bainsford in March or April 1882. The club’s 3rd ground, which they played on from then until the end of season 1882/83, was basically a playing field in Bainsford which was rented from Mungal Farm. At the start of season 1883/84 East Stirlingshire had moved again to their 4th ground, which was adjacent to one they had just vacated, and it was formally opened with a match against Our Boys (from Dundee). This east/west ground was rented from the owner of Mungal Farm, James Young, who would shortly afterwards become the Baillie for the Northern Ward of the town which included Bainsford. 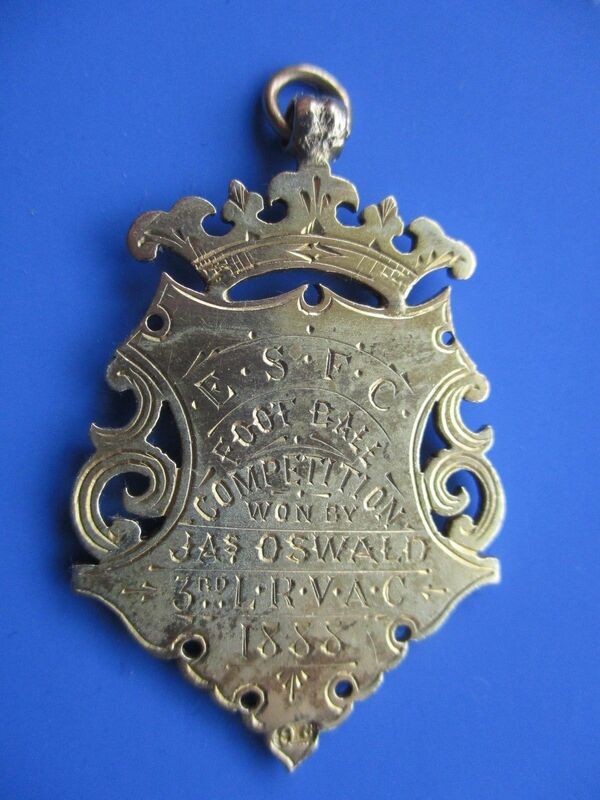 He was also the club’s 1st President from at least May 1883. Initially the ground was just a playing field but the club gradually improved it. Originally it did not having a name (it was known only as “the ground at Bainsford”) by the end of season 1885/86 it was referred to as “Bainsford Park”. At the end of that season extensive ground improvements were made, including levelling the pitch, and from the start of season 1886/87 the ground was formally named Merchiston Park with the club playing a friendly against Aston Villa in August 1886 to celebrate the occasion. 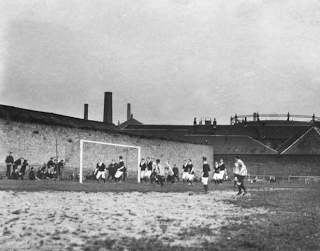 Merchiston Park during its’ history did have a “Match box” stand but after the great Ibrox disaster in 1902 along with other clubs in the district (Falkirk excepted) it was condemned. In the early years on the 20th Century Bainsford was continuing to be developed rapidly and one consequence was that the ground had to make way for a railway line to an iron foundry. So at the end of season 1905/06 the ground closed its gates for the last time. The following two maps show the actual locations of the club’s grounds from March/April 1882 to May 1921 (Grounds 3 to 5). 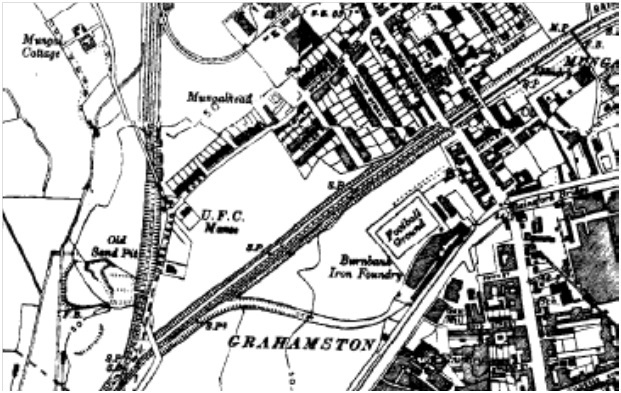 The first Ordnance Survey map from 1897 shows the location for Ground 4 (Merchiston Park). The basin just south of the ground was Burnhouse Basin. Church Street, to the East of the ground is the current Smith Street. The ground was entered from the East side through Black Close, just off the Bainsford Main Street. The following 1922 Ordnance Survey map shows the location of Ground 5 (New Merchiston Park) that the club played on and this area was also where Ground 3 was situated. Note the location of Mungal Cottage (where the club’s’ first President, James Young, lived) in the top left-hand corner of the map. It can be seen that the ground was situated south of the 4th ground and was a lot closer to the canal. The railway line where the old ground was can be seen as well. The ground was directly north of Burnbank Iron Foundry and the east side of the ground backed onto Burnhouse Basin.